Barf. It isn't generally the sort of term one associates with tasty or nutritious cuisine -- for either canine or human. But this isn't barf, this is BARF, and it may be the answer to many pet owners' concerns about the health and longevity of their dogs. 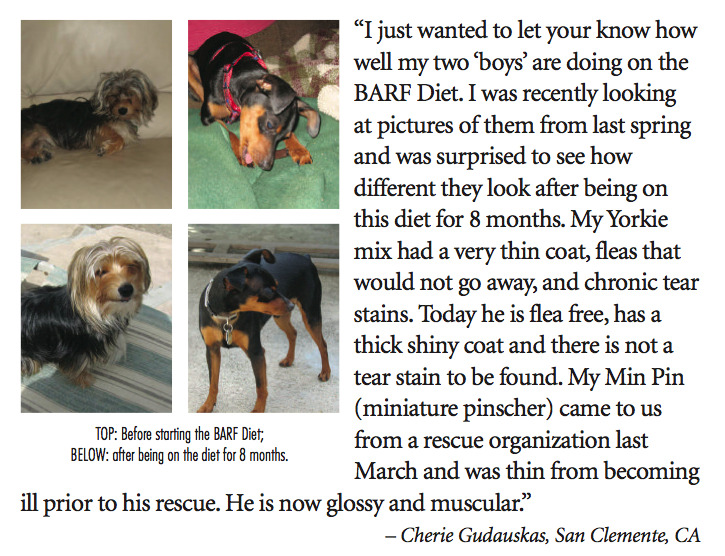 BARF stands for Biologically Appropriate Raw Food and advocates of this diet claim it can address a wide range of common canine afflictions, from dry skin and allergies to stomach sensitivities and tooth decay. In lieu of processed and chemical-laden "dog food," pet owners adhering to the BARF diet feed their dogs whole foods of the same quality that is deemed safe for human consumption. Fruits, veggies, ground bones, raw meat, and offal (entrails and internal organs) constitute the foundation of the BARF diet. And if your stomach is churning over the notion of figuring out how to get entrails into your dog's dish without significantly altering the cleanliness of your kitchen, have no fear! Pre-assembled meals following BARF guidelines are available at: www.barfworld.com. Proponents of the BARF diet point to the fact that this manner of eating closely follows the way dogs and cats were fed until the advent of processed dog food around the 1930s. 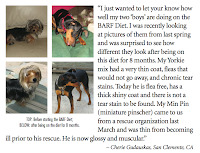 So pet owners who are concerned that perhaps this sort of diet is merely a fad or a passing trend should keep in mind that the BARF diet more closely resembles the way dogs ate in the generations before we began marketing kibble and canned pet food. Of course, there are pros and cons to all philosophies -- including those involving pet care. If you are interested in possibly transitioning your dog to the BARF diet, consider speaking to your veterinarian about the possible benefits of this all-natural "dog food." It may not be the first question you ask yourself when considering bringing a pooch into your home, but it often ends up being one of the most important: What size dog do I want? Some people just naturally gravitate toward the larger breeds: the labs, the working breeds, those irresistible sad-eyed hounds. However, some find that the small dog breeds are more suited to their lifestyles: the toy breeds and those scruffy terriers. Potential dog owners sometimes make the mistake of assuming a small dog breed is going to be less work than one of his larger cousins. In truth, the personality associated with a specific breed is going to dictate the needs of the dog much more than the size. For example, a Jack Russell (or, more officially, "Parson Russell") Terrier is quite small in stature but could out-play, out-run, and out-bounce a two year-old hopped up on cupcakes and fruit punch. Bullmastiffs are inarguably giants of the canine world, but are so docile and good-natured that they are often recommended as good apartment dogs! Small dog breeds are generally ideal for folks who love to romp and play and spend time outdoors. Other small dog breeds such as Chihuahuas, Pekingese, and Shih Tzu make exemplary lap dogs. When considering bringing a small dog breed into your home, ask yourself why you are adopting a dog in the first place. Most likely you will have more than a few reasons (most dog lovers do), so take the time to rank them in order of importance. Are you looking primarily for a late-night cuddly companion? A protector? A jogging buddy? Once you have a list of the desired canine qualities in front of you it will be easier to narrow your focus to a specific breed, or range of breeds. At this point it will be easy to decide whether a small dog breed is "just right" for you. When it comes to our closest canine companions, the health problems they encounter can be as unique as those sparkling personalities we rely on to brighten our day. A dog health problem isn't necessarily going to present the same across the spectrum of breeds. Some dog health problems are actually specific to certain breeds. Some pet owners wonder if there are any preventative measures they can take in terms of keeping their pup's physical health in check. 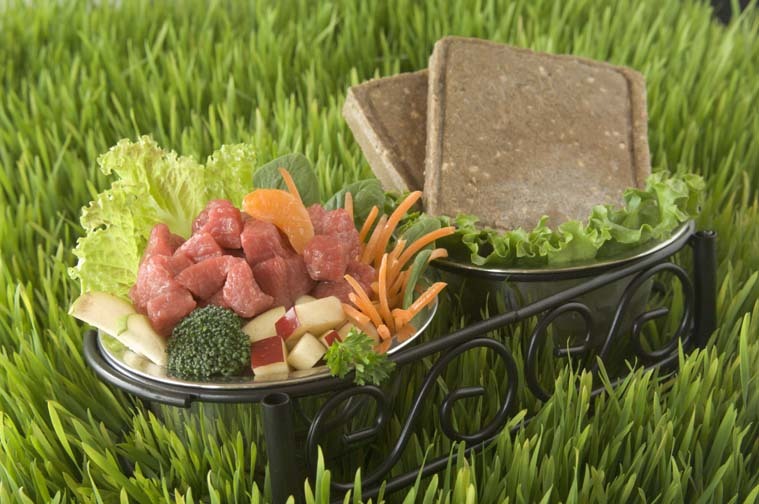 Dog health food is sometimes a popular option for folks who feel their own health benefits from a balanced, nutritious diet. Health-conscious dog owners gain comfort in looking after their animals' dietary needs with the same dedication they apply to monitoring their own. Some doggie lovers take it a step further and prepare their pet food from scratch, adding supplements such as Taurine and L-carnitine to ensure their pooch's nutritional needs are being met. The American Kennel Club has a website listing national breed clubs, and this is a fantastic resource if you are interested in learning more about dog health problems by breed. You can find this list at http://clubs.akc.org. In some ways, dog health is no more predictable than human health, but that doesn't mean that conscientious pet owners should not take the time to educate themselves on the possible ailments that may arise in the future. The American Kennel Club is always a fantastic trusted resource, as is your local chapter of the SPCA www.aspca.org or American Humane Society www.americanhumane.org. With a bit of preparation and, of course, a lot of love, your beloved pup can enjoy many years brightening the lives of his or her human companions. And if you have not yet joined our ranks of besotted doggie pals (after all, we say we are their owners -- but it is the pups who own our hearts), don't forget to research breed-specific health problems before making your final decision.